The evening will start with a drinks reception in the Gin Bar on the ground floor . Canapés will be served and guests will have an opportunity to savour the mouth watering canapés which will be paired with a refreshing Prosecco. Shortly after, guests will be shown to their seats on the mezzanine level. There will be tables of 10 guests so an opportunity to meet new people and share conversation, whilst starting with The Dublin Bay Prawn & Octopus Ceviche, paired with a Rose from South Africa. Each course will be introduced by Andrew and the wine will be introduced by Phil Green from Boutique Wines. Medley is located in the heart of Dublin 2, beside the Westin Dublin Hotel. It has a ground floor and mezzanine with seating for up to 250 guests and standing for 350. This is a stunning private hire and event space, which is brilliantly versatile. Inside the natural wood, bronze and antiques give it a New York feel. It’s open and airy, thanks to the balcony facing the glass wall on Fleet Street East, but with that natural wood, leather, bronze you’ve seen downstairs offset with antiques and great lighting design. 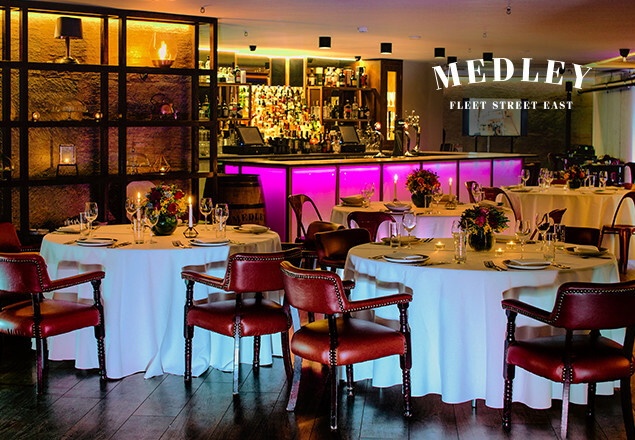 Upstairs, in the mezzanine, is a stunning private hire and event space we simply call Medley Upstairs. It’s open and airy, thanks to the balcony facing the glass wall on Fleet Street East, but with that natural wood, leather, bronze you’ve seen downstairs offset with antiques and great lighting design. The themes of international cuisine resonate in Medley with special menus created specifically for your event. If you’re planning an event and you really, really want to really wow your guests, hold it in Medley Upstairs. There’s nowhere like it in Dublin City. Andrew Rudd is a discoverer of all things food. Andrew has turned a lifelong passion for food into a successful and expanding career, primarily providing cookery demonstrations, private catering and fine dining to food lovers nationwide. Andrew has had a fascination with food for over 20 years and has explored the culinary delights of many cities around the world. Andrew features regularly on television and radio, with a new TV show being broadcast from September to December 2015 on Swipe TV with RTE. He published his 1st cookbook in October 2015, entitled “Entertaining with Andrew Rudd” and is currently working on his 2nd book. In recent years, Andrew fronted a TV advertising campaign for Domino’s Pizza, and endorsement campaigns for many other household brands. Andrew is currently the Brand Ambassador for Estrella Damm. Andrew gets a great sense of curiosity and pleasure out of encouraging others to discover new tastes and flavors. Combining different flavors, tastes, and culinary influences from around the world can provide us all with the creative passion that is so important in home cooking. Your voucher must be presented on arrival. Please arrive promptly at 7pm as dinner will be served at 7pm sharp.